I’ll just come right out and say it. "Prophecy" wasn’t a favorite episode of mine. Why? Well, I just do not understand how a strong, powerful woman like Lois Lane could be so easily influenced by Toyman. Even if she has a tracker inhibiting her actions. It really felt like an unnecessary plot contrivance to me. 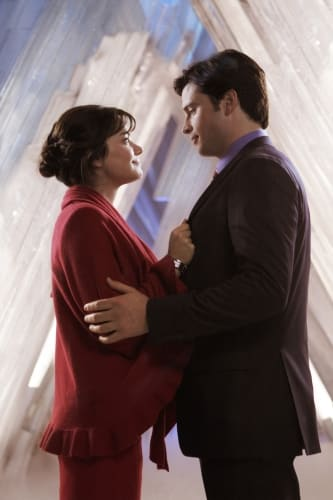 Set up only to push Lois’ mounting cold feet over the edge because she feels like she’s Clark’s biggest weakness. While there’s nothing wrong with that theme in and of itself the fact that the writers had to cook up something with Toyman and him being a puppeteer felt unnecessary. In fact, for me, it unnecessarily debases the character (which saddens me since the series finale is next week). Lois was easily coming to grips with the reality of just how much of a burden she could (potentially) be with Clark’s powers and how much he has to deal with on a daily basis. Instead, we get this version of Lois, someone who is pointlessly stripped of everything that makes her great for a plot with Toyman. After she stands up so strongly to him to protect the man she loves. 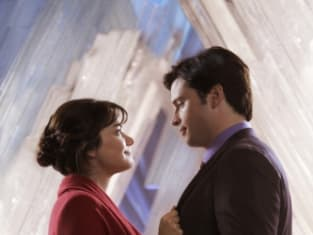 What makes it even worse is the overall theme of the episode is what was on Orion’s Bow: “True power comes from within.” Yet, Lois isn’t given that chance, she’s merely stalled long enough for Clark to get his powers back and rip the diode off her. At least we get to enjoy Kara and Oliver together in their search for Orion’s Bow. It was nice to see the two of them working together, each one representing light and darkness. I was fully expecting the bow to rid Oliver of his darkness. I never expected Oliver was being manipulated by Darkseid and his Merry Little Minions. On top of that, he’s manipulated by Granny Goodness into digging up the gold kryptonite to further their goals, didn’t see that coming! I’m glad Smallville gave Kara a proper sendoff. Giving her the choice of stepping out on her own to become a superhero, Supergirl, in her own right or continuing to live in Clark’s shadow. It was nice watching her weigh those decisions and ultimately deciding that although Clark is the only family she has left she went to the future to fulfill her own destiny. Just as Clark is doing. For Clark, this final “humanizing” done to him by Jor-El reminds me just how far he’s come since the beginning of the series. Showing just how comfortable he is with who he is and what he wants. It’s a nice payoff to see him truly being only steps away from becoming Superman. Although, I’m beginning to worry if Smallville has stalled the Darkseid story a little too long. There seems to be a lot of story to cover with only a two hour series finale next week. With Darkseid looming, Oliver’s manipulation, Lois’ cold feet, a wedding, the return of Lex, all while launching Clark to his inevitable destiny.